Poultry can be a great enterprise to add into a diverse farm operation and, if managed well, can be a great farm focus. The following pages review some of the basic information necessary for producing and marketing poultry and poultry products. 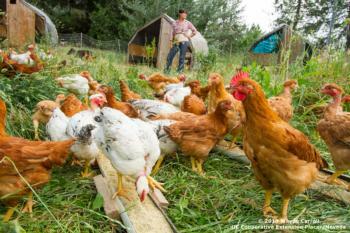 Virulent Newcastle Disease (vND) has been confirmed in a backyard flock in Alameda County! To report an unusual number of sick or dead birds, call the Sick Bird Hotline at (866) 922-2473. If you suspect that your own birds may have vND, do NOT submit the birds directly to CAHFS. Call the Sick Bird Hotline at (866) 922-2473, where staff can assess vND risk and ensure that the correct samples are collected for diagnosis. To minimize risk to your birds, follow CDFA's biosecurity guidelines. We are excited to have our own Mobile Poultry Processing unit here in the Sierra Nevada foothills! And the mobile poultry processor is managed by Nevada County grown and available to rent. Here's a slide show of the processing unit. For more details click here or send an email to poultry@nevadacountygrown.org.